Established in 1967, E.Y.E. Marine Consultants is a knowledgeable Canadian design and engineering firm. They have a large portfolio of vessels both commercial and recreational. They specialize in steel, aluminium, and FRP construction and can provide services in lofting, design, stability, performance analysis and project management. Web Site Snapshot: If available, above is a snapshot of the E.Y.E. 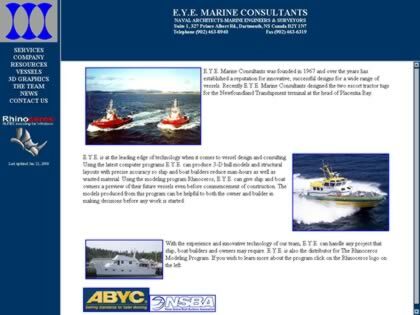 Marine Consultants web site at http://www.eyemarine.com as it appeared when this site was added to the directory or last verified. Please Note that Boat Design Net has no involvement with the above web site; all content and images depicted in the above thumbnail are the property and copyright of E.Y.E. Marine Consultants unless otherwise noted on that site. Description: Established in 1967, E.Y.E. Marine Consultants is a knowledgeable Canadian design and engineering firm. They have a large portfolio of vessels both commercial and recreational. They specialize in steel, aluminium, and FRP construction and can provide services in lofting, design, stability, performance analysis and project management.